Diwali, English Meaning: Festival of Lights also known as Deepawali is the biggest and the brightest festival in India. Honour to return Maryada Purushottam Shri Rama, his wife Mata Sita and his brother Shri Lakshmana from exile of 14 years after victory over the demon king Ravana (The King of Lanka). The festival spiritually signifies the victory of light over darkness. The festival preparations and rituals typically extend over a five-day period, but the main festival night of Diwali coincides with the darkest, new moon night. Goddess Lakshmi, Lord Ganesha, Lord Kuber, Lord Yamraj, God Dhanvantari, God Hanuman, Goddess Kali, Goddess Saraswati, Lord Krishna and Demon King Bali are the most prominent names worshipped during Diwali. Also called Dhantrayodashi, this day marks the birthday of Lakshmi, the Goddess of Wealth and Prosperity, and the birthday of Dhanvantari, the God of Health and Healing. Dhanteras is also a major shopping day, particularly for gold or silver articles. Merchants, traders and retailers stock up, put articles on sale, and prepare for this day. Lakshmi Puja is performed in the evening. Some people decorate their shops, work place or items symbolizing their source of sustenance and prosperity. 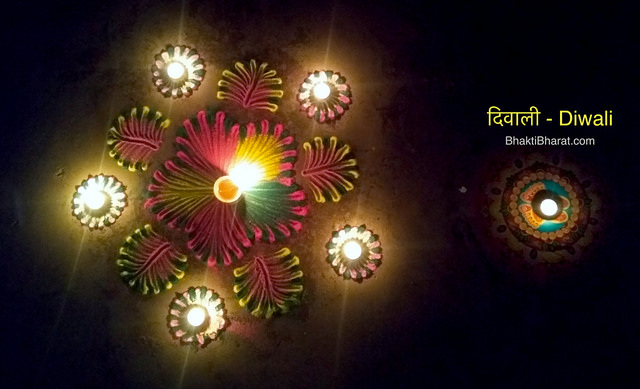 Badi Diwali is also known as Narak Chaturdasi, Roop Chaturdashi, Roop Chaudas and Kali Chaudas. Typically, house decoration and colourful floor patterns called rangoli are made on or before Narak Chaturdasi. In North India people celebrate this day as Badi Diwali, they light one Gee diya out side the house. Abhyang Snan on Narak Chaturdashi might be one day before or on same day of Lakshmi Puja day on English Calendar. When Chaturdashi Tithi prevails before sunrise and Amavasya Tithi prevails after sunset then Narak Chaturdashi and Lakshmi Puja fall on the same day. This day Maryada Purushottam Shri Rama, his wife Mata Sita and his brother Shri Lakshmana return from 14 years of vanvas (exile of 14 years) after victory over the demon king Ravana. People wear new clothes or their best outfits as the evening and visit relatives & friends, exchanging gifts and sweets. Then diyas are lit, pujas are offered to Lakshmi, and to one or more additional deities depending on the region of India, typically Ganesha, Saraswati, and Kubera. Lakshmi is believed to roam the earth on Diwali night. On the evening of Diwali, people open their doors and windows to welcome Lakshmi, and place diya lights on their windowsills and balcony ledges to invite her. Diwali also marks the beginning of new year, in some parts of India. Merchants and shopkeepers close out their old year, and start a new fiscal year with blessings from Lakshmi and other deities. Sikh celebrates Diwali as Bandi Chhor Divas and Jain celebrates it as a day to commemorate Mahavir. Govardhan Puja celebrated as the day when Lord Krishna defeated king of heaven Indra. Gowardhan Puja is also known as Annakut Puja. On this day food made of cereals like wheat, rice, curry made of gram flour and leafy vegetables is cooked and offered to Lord Krishna. The last day of festival is called Bhai dooj, Bhaiya Dooji or Bhai Tika. It celebrates the sister-brother loving relationship similar to Raksha Bandhan but with different rituals. The day ritually emphasizes the love and lifelong bond between siblings. Bandi Chhor Shodh Divas (Day of Liberation) (ਬੰਦੀ ਛੋੜ ਦਿਵਸ) is a Sikh festival which coincides with the day of Diwali. Bandi Chhor Divas celebrates the release from prison in Gwalior of the Sixth Guru, Guru Hargobind, and 52 other princes with him. The word Bandi is translated from Punjabi into English as Imprisoned (or Prisoner), Chhor (shodh) translates as Release, and Divas means Day, rendering Bandi Chhor Divas as Prisoners' Release Day. Guru Amar Das chose Diwali, later referenced as Bandi Chhor Divas, as one of the three festivals to be celebrated by Sikhs, the others being Maghi and Baisakhi (Vaisakhi). Shri Rama with his wife and his brother return after 14 years of exile.